The squirrels have pretty much given up trying to steal food from my feeders. They've been pretty content to eat on the patio wall or under the feeders. There's certainly no lack of food UNDER the feeders due to the woodpeckers and titmouse (or is it titmice?) throwing all the seeds out in search for their favorite morsels. 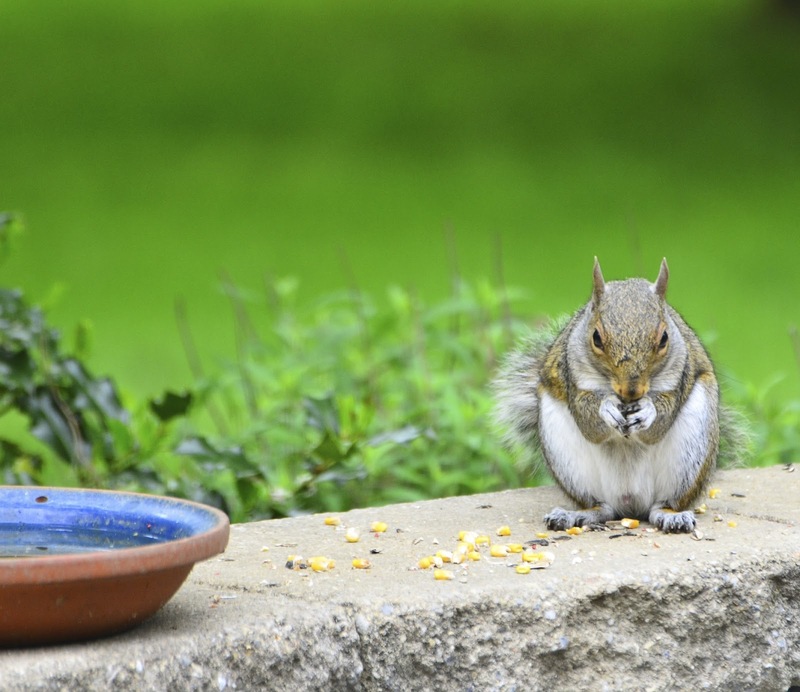 There's always some danger for them to feed from the patio stone wall though. Frequently, they will freeze and not move for minutes! Oftentimes, there is a good reason for this. Like this visitor who has just landed in the nearby trees. 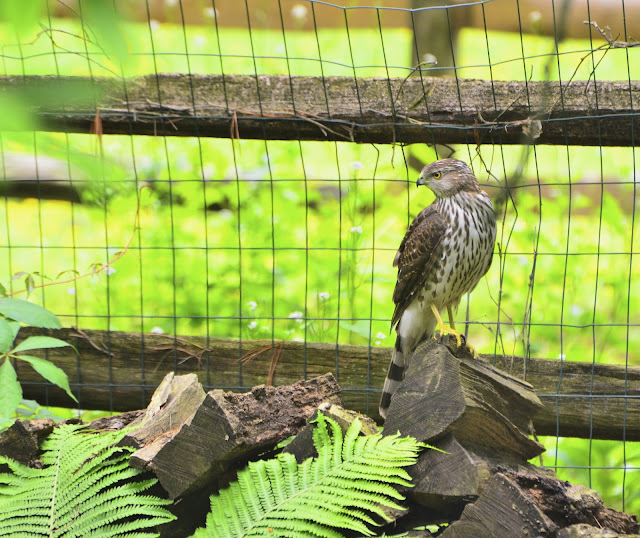 This Cooper's Hawk stops in occasionally checking things out. He has gotten so bold as to land on the patio wall. 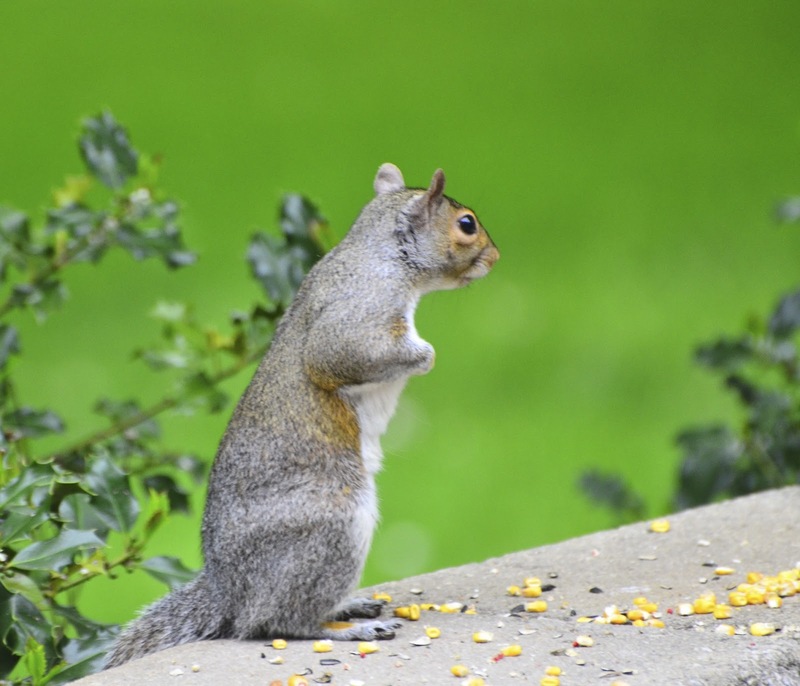 But so far, Rocky Squirrel has had luck on his side! as I grabbed my camera and began shooting. she was too fast for him! Hope your week is getting off to a great start. other 'stuff' that needed my attention. This Spring seems so busy ... a good busy ... but still busy. Can't wait to see what you've all been up to! What a capture of interesting nature moments! Loved them! Whew... glad the bushy-tailed ones escaped! Even if Mr. Hawk needed lunch. 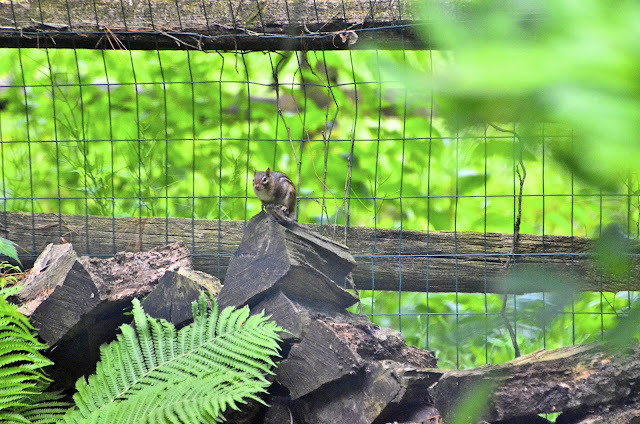 I love the squirrel and the Coopers Hawk and the little chipmunk that I'm glad didn't end up being dinner for the hawk -- even if he was hungry!! Superbly beautiful captures for the day, Reena, as always! Hope you have a great week! that cooper's is gorgeous! i wish the hawks here showed an interest in the squirrels! dang it! Wow! What awesome shots of that hawk! Really all these shots are stellar. The hawk is such a powerful looking bird. Great shots! Fantastic photos of the hawk, Reena! Wow!! Wonderful series...telling the tale the view from your window. That hawk looks like he means business. Wow, gorgeous images and the hawk ones are incredible. I'm glad he keeps escaping! Stay away, hawk! He's pretty scary....glad the squirrels are smart! Great photos and fun post! oh my....run little squirrel...a lot of beauty in that powerful raptor though...but run little squirrel....smiles. 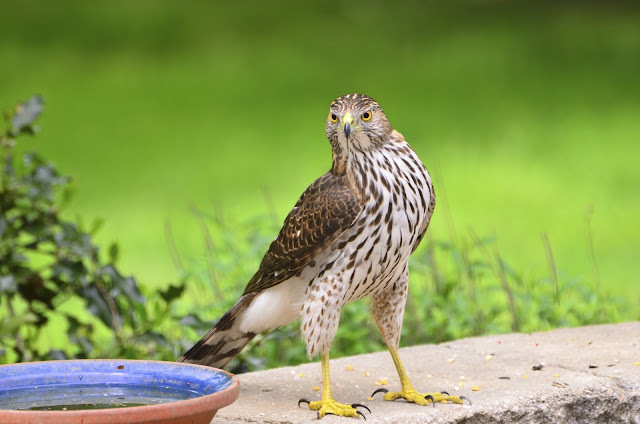 That's a brazen hawk, nicely captured I might add! You have the best stories to go along with your pictures. You should write childrens books. Truly amazing!!! A rare feast for the eyes, I have never seen a hawk be so bold! You must live in a very wooded area. Amazing shots..wish I had hawks in my neck of the woods to photograph. They are beautiful birds. Awesome!!! 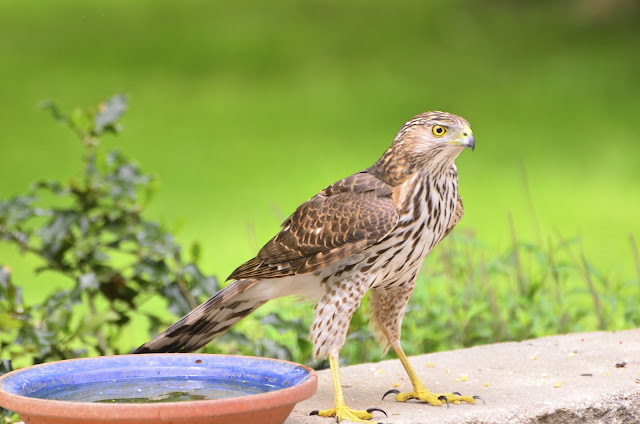 I like the pic sequences but especially of the Cooper's Hawk next to the dish....that shot really stands out. You are having a very good lens. 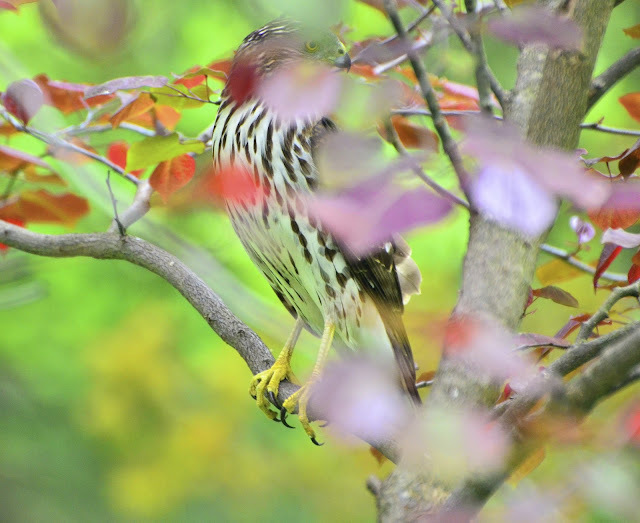 Amzaing captures of the Hawk!Thanks for sharing and have a great day! I love the stance of that hawk on the wall: "I'm in charge here! Where's the food!" 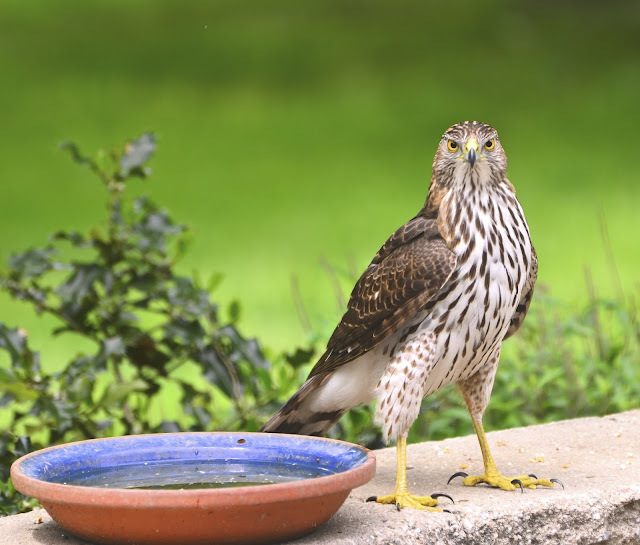 Hi Reena what wonderful pictures of the hawk. Your photo hobby has quickly turned into pictures worthy of National Geographic. It's just a super busy time of year! What marvelous wildlife photos ya have captured here. Thanks for sharin' 'em with us sweetie. Wonderful shots! I'm glad Carmen escaped! Fantastic shots! You always have such amazing stories that you tell with your pictures. I really love how you just photograph every day life as it unfolds and that you don't have to be looking everywhere to find great shots. What? Do you live in a zoo? What a mix of visitors you get, and those photos, so perfect, those creatures look fake. That bird is beautiful. 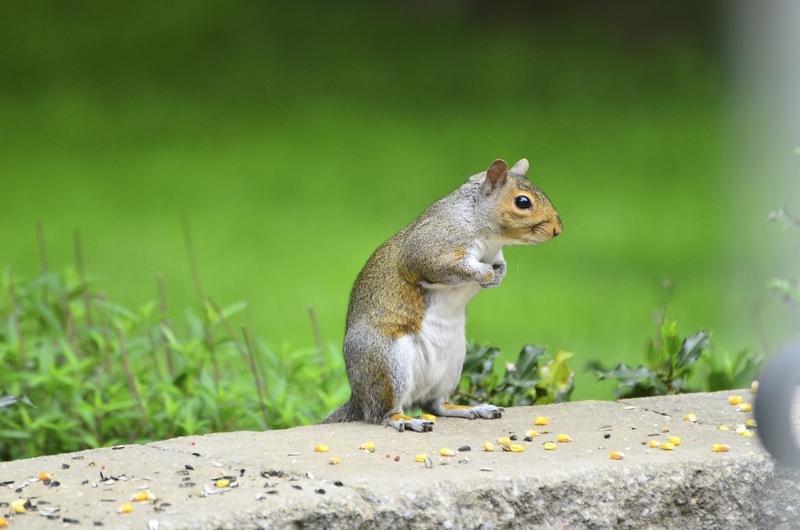 Let's hope rocky Squirrel stays lucky. That hawk look like he means business!! Great series of photographs Reena! oh my all of these shots are beyond beautiful!